Thanks for returning to How to Reinvent Yourself, Part 2. In my last blog we successfully created a routine for daily life that included grooming, healthy eating and sleeping patterns, and staying in touch with others. Now we are going to add something to this daily routine, doing one thing a day in the direction of your new life. 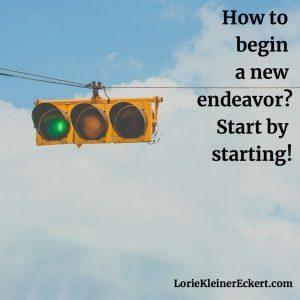 Remembering that starting a new endeavor is hard, let’s start by starting! Here is your assignment: Go on a field trip to an office supply store. Buy yourself a loose-leaf binder, notebook paper, and a set of dividers. When you return home, assemble your notebook. Label the first divider, “One Step Per Day.” On the first piece of paper write today’s date and record the fact that you successfully started your reinvention by creating this accountability log. Since you only have to do one thing a day, you are done for the day! 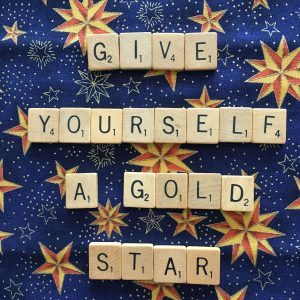 As you give yourself a gold star, start thinking about what step you will take tomorrow. When I suffered empty nest syndrome, the weight of my loss had me pinned to the sofa. With notebook in hand, I made a phone call to a charitable organization to see what kind of volunteer work was available. The next day I called another nonprofit. Thus my work for the March of Dimes began. Sincerely, it only took a week or two of similar actions to fill my life with meaningful activity and to blast myself off the couch. I was then able to put the notebook away…until my next reinvention. Reinventing myself after the death of my significant other, Big Irv, was a bit more complex but you can be sure I stuck to a routine. Instead of keeping an accountability notebook, per se, I wrote in a journal daily. I have long felt that when I talk about my pain, I give a piece of it away and a journal is a great place to talk things out. 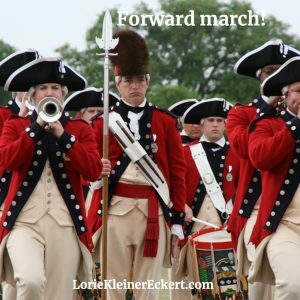 As I wrote, I didn’t know exactly where I was going, but “Forward March!” was my motto. As it turns out, all that writing turned out to be my new book, Love, Loss, and Moving On. I am convinced my subconscious mind knew all along that I was writing a book, but I didn’t. I just trusted that something would come from all those small steps forward daily. If nothing else, I was moving away from my pain. As these two examples show, the need for reinvention often comes at difficult times in life and such times often find us in a muddled state of mind. Thus my two-step recipe is intentionally simple. One needs to have a routine and stick to it; and one needs to take one step a day in the direction of a new life. Easy peasy! Well…not actually. We have all started countless diets and exercise programs only to abandon them after a week or two. So how do you stick with this reinvention plan? I think the answer is to have a cheerleader, and guess what? You’re it! Remember the other dividers in your notebook? They will help in this capacity. All of these sections will be works in progress and you should add to them regularly. These are lists for emotionally rainy days when you are not in the groove at all – they will help you remember all you are, all you have, all you dream to be. Divider 2: List all of your many capabilities and talents. If you have had a business career this will look like a resume. If you have spent a lifetime as a homemaker or volunteer, yours is just a resume of a different sort. You have done a lot. Write it down to remind yourself. Take pride in all your accomplishments. Divider 3: This is a gratitude log. Take inventory of all you have, be grateful for it, and think about how you can put it to use in creating what comes next. Divider 4: This is a journal of sorts. Taking advantage of your “raw material” (what you are and what you have), what do you want to be next? “I don’t know” is a fine answer, but having this divider ready and waiting will cause your subconscious mind to start thinking about it. Plus, you will be taking a step a day, so you are certainly going somewhere. Accept what is. Let go of what was. Have faith in what will be. There are seven days in a week, and Someday isn’t one of them. Stop thinking. Stop pondering. Stop strategizing. Stop debating. Go and do! On the road to success, even the smallest steps move you forward. You keep putting one foot in front of the other. And then one day you look back and you’ve climbed a mountain. Take that first step. Figure it out from there. In closing, please remember this: All that is important is that you keep taking those steps, keep taking those steps, keep taking those steps. Yes, some will turn out to be side-steps and others will be missteps. It matters not, just keep stepping. Note: I post my motivational messages six days a week on Facebook, LinkedIn, Twitter, Instagram, and Pinterest. All of the illustrations in this blog and the pep talk quotes are borrowed from those posts. Please follow my work on your favorite social media platforms. Glad you liked this post! I always enjoy sharing a list of motivational quotes! 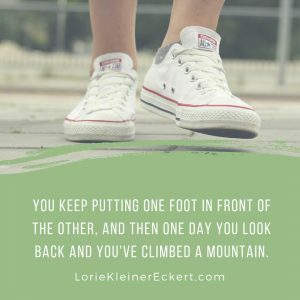 Always a lift to read your blog, Lorie! Thanks for the great reminders, and the cheerleading! Thanks, Rose. And, rah-rah! You can do it!! I love this one… detailed step-by-step instructions. Thanks, Vera! Glad you think this one is relevant!! Thanks, Sue. I am glad this was meaningful!